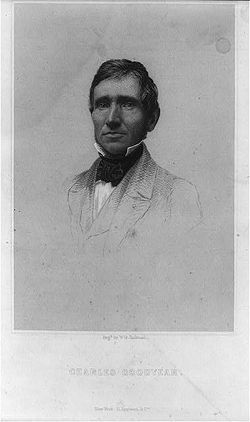 Portrait engraving of Charles Goodyear by W. G. Jackman. New York: D. Appleton & Co.
Charles Spencer Goodyear (December 29, 1800 - July 1, 1860) is widely credited as being the first to treat rubber for commercial purposes in a way that makes it firm and flexible in both hot and cold environments. Rubber thus treated can be fashioned into a wide variety of useful objects, components, and coatings. Goodyear also invented new materials fabricated from rubber and cotton fiber. Charles Goodyear was born in New Haven, Connecticut, on December 29, 1800. He was the son of Amasa Goodyear and the oldest of six children. His father was quite proud of being a descendant of Stephen Goodyear, one of the founders of the colony of New Haven in 1638. Goodyear's father owned a little farm on the neck of land in New Haven that is now known as Oyster Point, and it was here that Goodyear spent the earliest years of his life. When Goodyear was quite young, his father secured an interest in a patent for the manufacture of ivory buttons, and looking for a convenient location for a small mill, settled at Naugatuck, Connecticut, where he made use of the valuable water power there. Besides his manufacturing business, the elder Goodyear ran a farm, and between farming and manufacturing, kept the young Goodyear busy. Goodyear is said to have considered a career in the ministry at an early age (Iles 1912, 177), but in 1816, he left his home and went to Philadelphia to learn the hardware business. He worked industriously until he was twenty-one years old, and then, returning to Connecticut, entered into partnership with his father in Naugatuck, under the name Amasa Goodyear & Son. They manufactured a variety of items, such as ivory and metal buttons, metal spoons and forks, scythes, and clocks, along with a new line of farm tools and machinery designed by the elder Goodyear (Iles 1912, 177). In August of 1824, he was united in marriage with Clarissa Beecher, a woman of of remarkable strength of character and kindness of disposition; and one of great assistance to the impulsive inventor. Two years later, the family moved to Philadelphia, and there Goodyear opened a hardware store. His specialties were the new agricultural implements that his firm had been manufacturing, and after the first distrust of domestically-made goods had worn away—for a majority of agricultural implements were imported from England at that time—he found himself heading a successful business. This continued to increase until it seemed that he was to be a wealthy man. But because Goodyear had extended credit too freely, losses from non-paying customers mounted. At the same time, he refused to declare bankruptcy for fear of relinquishing his rights to patent a number of inventions that he was in the process of perfecting. Under existing law, he was imprisoned time after time for failing to pay his debts. While still a schoolboy, Goodyear first encountered what was then called gum elastic but what today is referred to as rubber, and its properties left a deep impression on him. Between the years 1831 and 1832, he began to carefully examine every article that appeared in the newspapers relative to this new material. Rubber's waterproofing qualities made it a good material to fashion such articles as boots and raincoats, but the material hardened in cold weather and softened in the summer to an almost putty-like, sticky consistency. The Roxbury Rubber Company of Boston, had been for some time experimenting with the gum, and believed it had found a way to manufacture goods from it. It had a large plant and was sending its goods all over the country. In 1834, some of Roxbury's goods first attracted Goodyear's attention (Hubert 1893, 158). The company produced a line of life preservers, and Goodyear noticed that the valve used to inflate the preservers did not operate well. He created his own design, and reported back to the company with the improved product. A company manager examined his design and was pleased with Goodyear's ingenuity. But he confessed to Goodyear that the business was on the verge of ruin. Thousands of dollars worth of goods that they had thought to be of good quality were being returned, the gum having rotted, making them useless. Goodyear at once made up his mind to experiment on this gum and see if he could overcome the problems with these rubber products. However, when he returned to Philadelphia, a creditor had him arrested and thrown into prison. While there, he tried his first experiments with India rubber. The gum was inexpensive then, and by heating it and working it in his hands, he managed to incorporate in it a certain amount of magnesia, which produced a beautiful white compound and appeared to take away the stickiness. He thought he had discovered the secret, and through the kindness of friends was enabled to improve his invention in New Haven. The first thing that he made was shoes, and he used his own house for working the material with the help of his wife and children. His compound at this time consisted of India rubber, lampblack, and magnesia, the whole dissolved in turpentine and spread upon the flannel cloth that served as the lining for the shoes. It was not long, however, before he discovered that the gum, even treated this way, became sticky. His creditors, completely discouraged, decided that he would not be allowed to go further in his research. Goodyear, however, had no mind to stop his experiments. Selling his furniture and placing his family in a quiet boarding place, he went to New York and in an attic, helped by a friendly druggist, continued his experiments. His next step was to compound the rubber with magnesia and then boil it in quicklime and water. This appeared to solve the problem. At once, it was noticed abroad that he had treated India rubber to lose its stickiness, and he received international acclaim. He seemed on the high road to success, until one day he noticed that a drop of weak acid that fell on the cloth neutralized the alkali and immediately caused the rubber to become soft again. This proved to him that his process was not a successful one. He therefore continued experimenting. After preparing his mixtures in his attic in New York, he would walk three miles to a mill in Greenwich Village to try various experiments. In the line of these, he discovered that rubber dipped in nitric acid formed a surface cure, and he made many products with this acid cure, which were held in high regard. He even received a letter of commendation from American President Andrew Jackson. Exposure to harsh chemicals, such as nitric acid and lead oxide, adversely affected his health, and once he nearly suffocated in the gas generated in his laboratory. He survived, but the resulting fever came close to taking his life. Goodyear convinced a businessman, William Ballard, to form a partnership based on his new process (Hubert 1893, 184). The two established manufacturing facilities to produce clothing, life preservers, rubber shoes, and a great variety of rubber goods, first at a factory on Bank Street in Manhattan, and then in Staten Island, where Goodyear also moved his family. Just around this time, when everything looked bright, the financial panic of 1837 swept away the entire fortune of his associate and left Goodyear penniless as well. Goodyear's next move was to go to Boston, where he became acquainted with J. Haskins, of the Roxbury Rubber Company. Goodyear found him to be a good friend, who lent him money and stood by him when no one would have anything to do with the visionary inventor. E.M. Chaffee, who had founded Roxbury, was also exceedingly kind and ever ready to lend a listening ear to his plans, and to assist him in a pecuniary way. About this time, it occurred to Mr. Chaffee that much of the trouble that they had experienced in working India rubber might come from the solvent that was used. He therefore invented a huge machine for doing the mixing by mechanical means. The goods that were made in this way were beautiful to look at, and it appeared, as it had before, that all difficulties had been overcome. Goodyear discovered a new method for making rubber shoes and received a patent that he sold to the Providence Company in Rhode Island. However, a method had not yet been found to process rubber so that it would withstand hot and cold temperatures and acids, and so the rubber goods were constantly growing sticky, decomposing, and being returned to the manufacturers. In 1838, Goodyear met Nathaniel Hayward in Woburn, Massachusetts, where Hayward was running a factory. Some time after this, Goodyear himself moved to Woburn, while continuing his experiments. Heyward had received, in a dream, a formula for hardening rubber by adding sulfur to gum, and exposing it to the heat of the Sun (Iles 1912, 186). Goodyear encouraged Hayward to patent his new discovery, which he did. Goodyear then purchased the patent from him. Using this process enabled Goodyear to produce better quality goods, but he also found that the process only hardened the outer layer of rubber objects. He thus became saddled with a large inventory of goods that were of no use to their purchasers. In the winter of 1838-1839, Goodyear noticed that some of the ruined rubber goods that had been returned to him, when accidentally brought into contact with a hot stove, charred in the same way that leather would, instead of melting. He realized that some of the material was merely hardened, and not charred, by the fire. It thus appeared that heating the rubber that had been treated with sulfur would harden it throughout and remove its stickiness. This treated rubber would not soften at elevated temperatures, nor become inflexible at low temperatures, the way untreated rubber would. He tried to bring this new discovery to the attention of friends and relatives, but they did not realize its significance (Iles 1912, 189-190). When summer came around, he found that objects fashioned with rubber made by his new process did not become soft. Interestingly, the term "vulcanization" used to describe Goodyear's process was not coined by Goodyear himself but by James Brockedon, a rubber products manufacturer (Iles 1912, 200). Now Goodyear was sure he had the key to the intricate puzzle that he had worked on for so many years. For a number of years, he struggled and experimented and worked along in a small way, his family suffering with himself the pangs of extreme poverty. The winter of 1839-1840 was particularly severe, and Goodyear had to depend on friends for financing to support his family and continue his work. At the beginning of 1840, a French firm made an offer for the use of his earlier process to produce rubber goods. Goodyear declined, saying that the new process that he was perfecting would be far superior to that which the French firm wanted to use (Hubert 1893, 170). At last he went to New York and showed some of his samples to William Rider, who, with his brother Emory, at once appreciated the value of the discovery and started in to manufacturing. Even here, Goodyear's bad luck seemed to follow him, for the Rider brothers failed and it was impossible to continue the business. By 1841, however, Goodyear had started a small factory in Springfield, Massachusetts, with the backing of his brother-in-law, William De Forest, who was a wealthy woolen manufacturer. The work of making the invention practical was continued. In 1844, the process was sufficiently perfected that Goodyear felt it safe to take out a patent, although he spent upwards of $50,000 in research costs to achieve this result. The Springfield factory was run by his brothers, Nelson and Henry. In 1843, Henry started a new factory in Naugatuck, and in 1844, introduced mechanical mixing in place of the use of solvents. Goodyear eventually declared bankruptcy to settle debts that had accumulated during his leaner years. He is said to have repaid $35,000 to his creditors (Iles 1912, 197). Besides the vulcanizing process, Goodyear invented a material composed of a mixture of vulcanized rubber and cotton fiber, which could easily be fashioned into durable sheets for the production of rubber goods. There were other players in the rubber market, most prominent among them being Horace H. Day, who around the time Goodyear was granted his first patents, also took out patents on various processes relating to rubber production. An immense legal contest followed, in which the two men and other rubber-producing groups struggled to maintain their right to manufacture goods. Goodyear's former employee, Hayward, often entered into the contest, sometimes on Goodyear's behalf, but at other times on the side of Day. In the end, Day was completely driven out of the business, although he had put up a fight of some eight years to defend his position. In the meantime, a process was developed in England that used only sulfur and steam, and was considered by many as superior to Goodyear's. All of these developments complicated the situation for Goodyear, and prevented him from reaping the profits that he would otherwise have realized from his invention (Anonymous 1856). In 1851, Goodyear received the great council medal at the London Exhibition for his rubber products. His finances, however, did not improve substantially in subsequent years. He had trouble enforcing compliance with his American patents, and he eventually lost some of his European patents. In Great Britain, Thomas Hancock claimed to have reinvented vulcanization and secured patents there, although he admitted in evidence that the first piece of vulcanized rubber he ever saw came from America. In 1852, a French company (Aigle) was licensed by Mr. Goodyear to make shoes, and a great deal of interest was felt in the new business. In 1853, Goodyear's wife died, and he remarried a year later to Fanny Wardell, a British subject. The couple had three children. In 1855, he staged a major exhibition of rubber products in Paris. The French emperor gave Goodyear the Grand Medal of Honor and decorated him with the Cross of the Legion of Honor in recognition of his services as a public benefactor. But having exhausted his resources, he was arrested and imprisoned, soon afterward managing to regain his freedom. Ironically, the French courts later set aside his French patents on the grounds that vulcanized goods had already been brought into France that had been manufactured under Goodyear's U.S. patents. His health failing, Goodyear retired to Bath, England, where he remained with his family from 1856 to 1858. During this time, his business affairs fell into chaos from neglect. Upon his return to America, he settled in Washington D.C., secured the renewal of his patents, and brought the affairs of his company under control. Goodyear successfully patented over 60 inventions and processes during his career, and was continually perfecting the products he produced (Hubert 1893, 175). Goodyear died July 1, 1860, while traveling to see his dying daughter. After arriving in New York, he was informed that she had already died. He collapsed and was taken to the Fifth Avenue Hotel in New York City, where he died at the age of fifty-nine. He is buried in New Haven at the Grove Street Cemetery. He left his family saddled with debts, and an attempt to have his patents extended for the benefit of his children was unsuccessful. By this time, Goodyear had already won an international reputation for his accomplishments. Among Goodyear's seven children was Professor William Henry Goodyear, who became curator of the Department of Fine Arts of the Brooklyn Institute of Arts and Sciences. A grandson, Charles Goodyear, was the inventor of several processes involving acetylene (Iles 1912, 178). Rubber was first synthesized artificially by William Tildenin in 1892, from isoprene, a compound derived from turpentine. Interestingly, recent evidence indicates that Mesoamericans used stabilized rubber for balls and other objects as early as 1600 B.C.E. Goodyear was, like so many other scientists and inventors, obsessed with the object of his interest, a vision enabling him to endure great trials. Many artists, scientists, writers, and political activists have been known to act similarly toward their causes. Certainly his contribution was one of great utility to human society. But like so many inventions, a number of investigators had established important preliminary steps before Goodyear put the final pieces together. Vulcanized rubber, remaining firm yet flexible over a wide range of temperatures, was considered even in Goodyear's lifetime to be a great discovery. After vulcanization, natural rubber remains flexible above the temperature required to liquify air, to about 270 degrees centigrade. It is not affected by nitric acid, one of the most reactive chemicals known to science. It can be worked to a hardness rivaling ebony and ivory. One of the most widely used applications of rubber is in the manufacture of tires for transportation vehicles. This application was patented in 1845 by Robert William Thomson of Great Britain, who also manufactured the first rubber inflatable tires (Iles 1912, 205). Goodyear is most popularly known for the tire company named after him. In 1898, almost four decades after his death, the Goodyear Tire and Rubber Company was founded and named by Frank Seiberling. On February 8, 1976, Goodyear was among six selected for induction into the National Inventors Hall of Fame. In his hometown of Woburn, Massachusetts, there is an elementary school named after him. ↑ D. Hosler, S. L. Burkett, and M. J. Tarkanian, Prehistoric polymers: Rubber processing in ancient Mesoamerica, Science June (1999): 1988-1991. Anonymous. 1856. The Great India-Rubber Litigation: A Few Chapters from Its History. The Merchants' Magazine and Commercial Review. 34:319-326. Hubert, Philip Gengembre. 1893. Charles Goodyear. In Inventors. New York: C. Scribner's Sons. Goodyear.com. The Charles Goodyear Story: The Strange Story of Rubber. Retrieved November 11, 2007. Iles, George. 1912. Charles Goodyear. In Leading American Inventors. New York: Henry Holt and Co.
Today in Science History - Goodyear's U.S. Patent No. 240: Improvement in the Process of Divesting Caoutchouc, Gum-Elastic, or India-Rubber of its Adhesive Properties, and also of Bleaching the Same, and Thereby Adapting it to Various Useful Purposes. This page was last modified on 2 February 2017, at 20:57.